NASA Images: Large parts of India dotted with fires, Due to Heat? 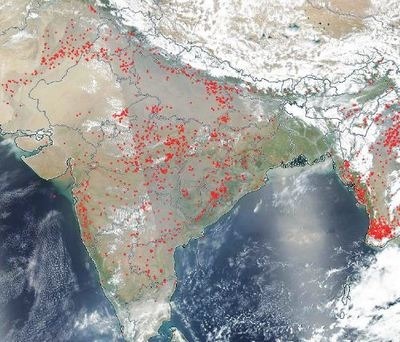 : Well, National Aeronautics and Space Administration (NASA) released some images of past ten days which are showing that large parts of India are dotted with fires. You all can see that in the picture that stretching across Uttar Pradesh (UP), Madhya Pradesh (MP), Maharashtra, Chhattisgarh and even some southern states are showing the red dots. 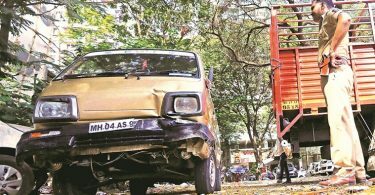 You can say that sweltering summer is the reason for these fires which is causing intensifying heat and causing black carbon (a component of soot with high global warming effect) pollution. Also, the reports are suggesting that some of those places are forest fires but Hiren Jethva, research scientist, Universities Space Research Association (USRA) at Nasa Goddard Space Flight Center indicated that these fires in central India may be mostly crop fires as forest fires are usually uncontrolled and, therefore, produce more smoke and haze. Also, the Agricultural scientists are linking the massive rise in the incidence of crop fires in recent years to the dependence of farmers on combine harvesters, which leave short stubble behind. The practice of crop stubble burning is not limited to the northern states of Haryana and Punjab, where the problem is rampant. Also, the burning of paddy stubble has been a common practice among farmers since it is unsuitable as fodder, increasing incidence of wheat stubble burning is a relatively new trend.